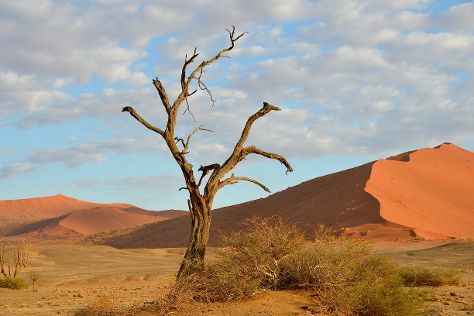 One of the world's largest nature and game reserves, the vast Namib-Naukluft Park boasts sweeping desert and mountain landscapes, a diverse range of animal life, and the surreal Sossusvlei, a scenic saltpan sprinkled with towering red sand dunes and petrified acacia trees. On the 6th (Fri), get outside with Deadvlei and then admire nature's extreme beauty at Sossusvlei. Here are some ideas for day two: take in breathtaking views at Sesriem Canyon and then explore the fascinating landscape at Namib Desert. To find reviews, ratings, maps, and tourist information, you can read our Namib-Naukluft Park trip builder. Anchorage, USA to Namib-Naukluft Park is an approximately 45-hour flight. Due to the time zone difference, you'll lose 10 hours traveling from Anchorage to Namib-Naukluft Park. Cap off your sightseeing on the 8th (Sun) early enough to go by car to Luderitz. Start off your visit on the 9th (Mon): don't miss a visit to Woermannhaus, then see the interesting displays at Luderitz Museum, then take in the architecture and atmosphere at Felsenkirche, and finally steep yourself in history at The Goerke House. Get ready for a full day of sightseeing on the next day: enjoy the sea views from Diaz Point, explore the fascinating landscape at Agate Beach, and then mingle with the ghosts of the past at Kolmanskop Ghost Town. To see other places to visit and other tourist information, use the Luderitz trip itinerary builder. You can drive from Namib-Naukluft Park to Luderitz in 10 hours. 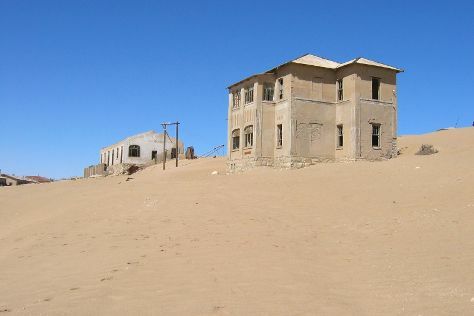 October in Luderitz sees daily highs of 71°F and lows of 52°F at night. Wrap up your sightseeing on the 11th (Wed) to allow time to travel to Windhoek. Get a sense of the local culture at Christuskirche and Katutura Township. Visiting NamibRand Nature Reserve and Fish River Canyon Nationalpark will get you outdoors. There's still lots to do: see exotic creatures in open habitats at a safari tour, see the interesting displays at Trans-Namib Railroad Museum, explore and take pictures at Okapuka Ranch, and buy something for everyone on your list at Maerua Mall. To find reviews, traveler tips, more things to do, and tourist information, refer to the Windhoek travel itinerary planner. You can do a combination of flight and car from Luderitz to Windhoek in 2 hours. Another option is to drive. Expect somewhat warmer temperatures when traveling from Luderitz in October; daily highs in Windhoek reach 90°F and lows reach 62°F. Cap off your sightseeing on the 15th (Sun) early enough to travel to Walvis Bay. A pleasant port city, Walvis Bay offers tourists a variety of urban entertainment options that complement its many natural attractions. On the 15th (Sun), take a leisurely stroll along Swakopmund Jetty, then browse for treasures at Peter's Antiques, and then add some adventure to your tour with a kayaking and canoeing tour. Get ready for a full day of sightseeing on the 16th (Mon): take a leisurely stroll along Walvis Bay Waterfront, head off-road at local off-road trails, and then see the interesting displays at Swakopmund Museum. To see traveler tips, photos, other places to visit, and tourist information, refer to the Walvis Bay trip itinerary planner. You can do a combination of car and flight from Windhoek to Walvis Bay in 1.5 hours. Other options are to take a bus; or drive. Traveling from Windhoek in October, expect nights in Walvis Bay to be little chillier, around 51°F, while days are cooler, around 70°F. Finish up your sightseeing early on the 16th (Mon) so you can travel back home.